I think I’d describe Ramune as “carbonated beverage” if I had to choose from all the listed names above. When I think of “pop” I think bright and vibrant, “soda” nice and tasty, and “soft drink” generic but acceptable. Carbonated beverage is reserved for that class of beverages that doesn’t fit under any other name because they just don’t have the drink moxie to carry a cute and clever moniker. Oh, and that class of beverage that is also carbonated. Not such a ringing endorsement eh? 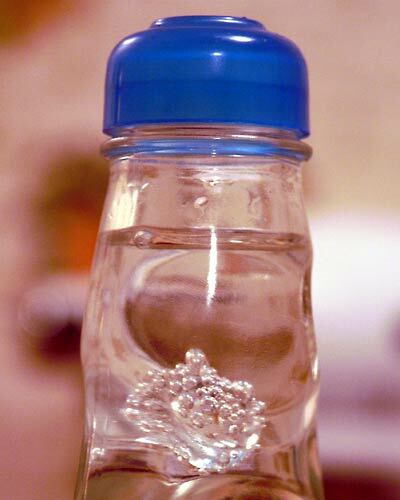 Well, Ramune is carbonated…I’ll give it that but it’s a carbonation of tiny proportions. You can hear the bubbles and you can sort of taste the bubbles but it’s more fizzy than bubbly. Pop (cola, soda, etc. ad nauseum) shouldn’t be fizzy; fizzy is right around the corner from flat and flat pop is narst! I’d say that on a scale of 1 to 5 of carbonated where Vernors is a 6 and flat pop is a 1, Ramune hovers near 2 maybe 2.5. Maybe. Once you can get past the disappointment of the fizzy, you can contemplate the taste. Sadly, the taste is also rather “carbonated beverage” with its unidentified citrus quality. I could peg the taste as definitely citrus but I know that I’d never be able to pick it out of a line up. It’s not a bad taste, but it’s sort of everybody’s generic lemon/lime/grapefruit/citrus flavor taste. It does have a bit of an aftertaste though which didn’t sit quite right with either me or my Guinea Pig. I was more bothered by the generic citrus than the aftertaste but my Guinea pig was really rather quite offended by the aftertaste. One thing it did offer that most other soft drinks do not is The Sweet. Oi! It was almost cloyingly sweet but it never actually got there, just really close. Still, not something I’m used to in a soda. You might think the review is done but not quite. I wanted to touch on the construction of Ramune packaging. The bottles come with the tops all shrink wrapped and what I thought was a sort of water bottle top thing was actually a separate tube and flat thingit. Once you take the shrink wrap off (and the tube and flat thingit fall on the floor because they are not in fact anything like the top of a water bottle, or attached) there is a glass marble sitting in the middle of a slight dome like top. The tube and flat thingit are for punching the marble (which is rather standard marble sized) down into the bottle neck where the divots keep it from…ahhhh…well going to the bottom I suppose. What you are left with is the actual drinking platform for Ramune: a marble sized hole in the middle of smooth dome top. Not the most ergonomic way to drink soda. I can’t say that I’m really impressed at all with the whole thing because I can’t easily drink from it without spilling and all I get for my troubles is a marble in the neck of a bottle. Errr…OK then. Great marble, I’m going to go have a bottle of Coke because at least I can drink that with confidence. My Guinea pig and I did wonder about the marble though and yes, it will float right back to the opening if you invert the bottle. Hard for pouring but maybe the perfect thing if you have the urge to drink your soda like a gerbil. As a side note, if you happen to get a bug up an orifice about liberating the marble let me save you from several minutes of frustrated top mangling: Just break the bottle, that’s the only sane way to get the damned little gerbil marble. I’m just sayin. Rating of 2.5 Wasabi Pea out of a possible 5. 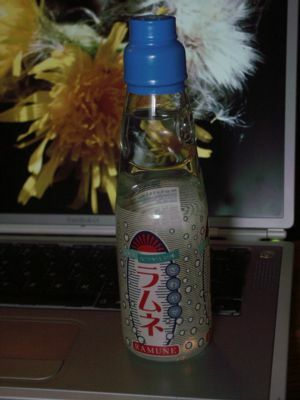 Ah, Ramune, the drink that led me to this site. Also, you forgot it’s indestructible-ness. I’ve seen it dropped from the second floor of a hotel to the first bloor and it didn’t break; it BOUNCED.